Based on the success of deep brain stimulation (DBS) for treating movement disorders, there is growing interest in using DBS to treat schizophrenia (SZ). We review the unmet needs of patients with SZ and the scientific rationale behind the DBS targets proposed in the literature in order to guide future development of DBS to treat this vulnerable patient population. SZ remains a devastating disorder despite treatment. Relapse, untreated psychosis, intolerable side effects and the lack of effective treatment for negative and cognitive symptoms contribute to poor outcome. Novel therapeutic interventions are needed to treat SZ and DBS is emerging as a potential intervention. Convergent genetic, pharmacological and neuroimaging evidence implicating neuropathology associated with psychosis is consistent with SZ being a circuit disorder amenable to striatal modulation with DBS. Many of the DBS targets proposed in the literature may modulate striatal dysregulation. Additional targets are considered for treating tardive dyskinesia and negative and cognitive symptoms. A need is identified for the concurrent development of neurophysiological biomarkers relevant to SZ pathology in order to inform DBS targeting. Finally, we discuss the current clinical trials of DBS for SZ, and their ethical considerations. We conclude that patients with severe symptoms despite treatment must have the capacity to consent for a DBS clinical trial in which risks can be estimated, but benefit is not known. In addition, psychiatric populations should have access to the potential benefits of neurosurgical advances. Most patients taking antipsychotics experience one or more side effects. These side effects include: extrapyramidal symptoms related to movement (34%–58%), hyperprolactinaemia (31%–39%), akathisia (7%–35%), sedation (47%), fatigue (60%) and sexual dysfunction (30%–80%).3 Other life-threatening side effects include agranulocytosis, impaired glucose metabolism, myocarditis, neuroleptic malignant syndrome, seizures and significant weight gain.3 In summary, novel therapeutic interventions for the treatment of SZ are needed for the 19%–25% of individuals with poor outcome, 19%–30% of individuals who consistently relapse and 15% of individuals experiencing intolerable or life-threatening antipsychotic side effects. Precedent for DBS treatment of symptoms of SZ has been demonstrated with the success of DBS for treatment-resistant Parkinson’s disease (PD), essential tremor (ET) and dystonia, and is being investigated for psychiatric illnesses like major depression and obsessive-compulsive disorder (OCD).8–11 As for PD, ET, dystonia, major depression and OCD, we present evidence that SZ is a circuit disorder and therefore might be amenable to neuromodulation with DBS to treat disease symptoms. Striatal circuitry within the basal ganglia-thalamocortical circuit. *Potential deep brain stimulation (DBS) targets to treat schizophrenia (SZ) from table 2 and figure 3; A. Normal circuitry. B. Effects of aberrancies implicated in schizophrenia circuitry. grey arrows=glutamatergic; black arrows=dopaminergic; black striped=GABAergic; black dashed=cholinergic; ACC, anterior cingulate cortex; AS, associative striatum; DG, dentate gyrus; DLPFC, dorsolateral prefrontal cortex; dSNc, dorsal tier SNc; GPe/GPi, globus pallidus external/internal; MD, medial dorsal; mPFC, medial prefrontal cortex; MSN, medial septal nucleus; NAc, nucleus accumbens; SGCWM, subgenual cingulate white matter; SMS, sensorimotor striatum; SNc/r, substantia nigra pars compacta/pars reticulata; STN, subthalamic nucleus; VC/VS, ventral capsule/ventral striatum; VIM, ventral intermediate nucleus; vSNc, ventral tier SN pars compacta; VTA, ventral tegmental area. Ventral striatum (VS) and associative striatum (AS) are possible DBS targets with potential to normalise dopaminergic tone in the striatum. Neuroimaging studies using positron emission tomography (PET) or single-photon emission CT have quantitated displacement of radiolabeled neurochemicals relevant to the brain dopamine transporters, D2 availability, D2 occupancy, dopamine synthesis and amphetamine-induced dopamine release. These studies indicate that D2 receptor occupancy in striatum is positively related to clinical improvement, and the therapeutic window for antipsychotics with moderate to high affinity for D2 occurs at a receptor occupancy level of 60%–80% in the striatum (table 1).19 D2 receptor numbers show a small elevation in patients with SZ.21 However, the major finding in first-episode, medication-naïve patients, and in patients receiving antipsychotic treatment, was an elevation of presynaptic dopamine in the striatum measured in multiple ways—including radiolabeled L-3,4-dihydroxyphenylalanine uptake, amphetamine-induced dopamine release and basal levels of synaptic dopamine (table 1).21 Finally, striatal dysfunction may be distinct in treatment-resistant patients with SZ.46 47 Fortunately, DBS programming individually optimises therapy and may be able to compensate for some variation between patients. Still, DBS response is anticipated to vary based on target and patient selection. Striatonigrostrial ascending spiral of subcircuitry involved in striatal dopamine regulation. 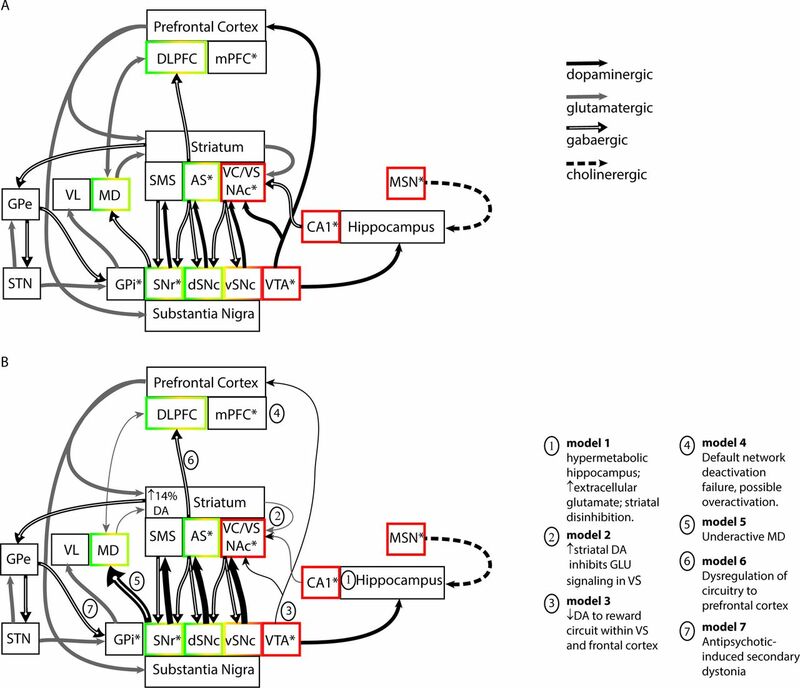 Closed reciprocal (CR) loop representing dopaminergic neurons projecting to distinct regions in the striatum and reciprocal inhibitory projections (double headed arrows) and disinhibitory feedforward regulation to adjacent substantia nigra (SN) regions (single headed arrows). DLPFC, dorsolateral prefrontal cortex; dSNc, dorsal tier SNc; mPFC, medial prefrontal cortex; OPFC, orbital prefrontal cortex; SNr, substantia nigra pars reticulata; vSNc, ventral tier SN pars compacta; VTA, ventral tegmental area. Striatum in conjunction with frontal lobe circuitry contributes to negative and cognitive symptoms. DBS of hippocampus and medial septal nucleus (MSN) may modulate striatal circuitry. While VS is a primary candidate for targeting psychosis, it is also a candidate for targeting negative symptoms of SZ due to its role in the reward circuitry involving ventral tegmental area (VTA), nucleus accumbens (NAc) and prefrontal cortex.15 Striatal activation, assessed with functional MRI (fMRI), occurs during reward feedback and anticipation in healthy subjects. During similar reward feedback and anticipation tasks, patients with SZ demonstrated hypoactivation in VS, which was correlated with severity of negative symptoms (table 1).15 Together, these findings are consistent with SZ being associated with both increases in presynaptic dopamine causing psychotic symptoms and with hypoactivation of the striatum, that in conjunction with frontal lobe circuitry may contribute to cognitive and negative symptoms. 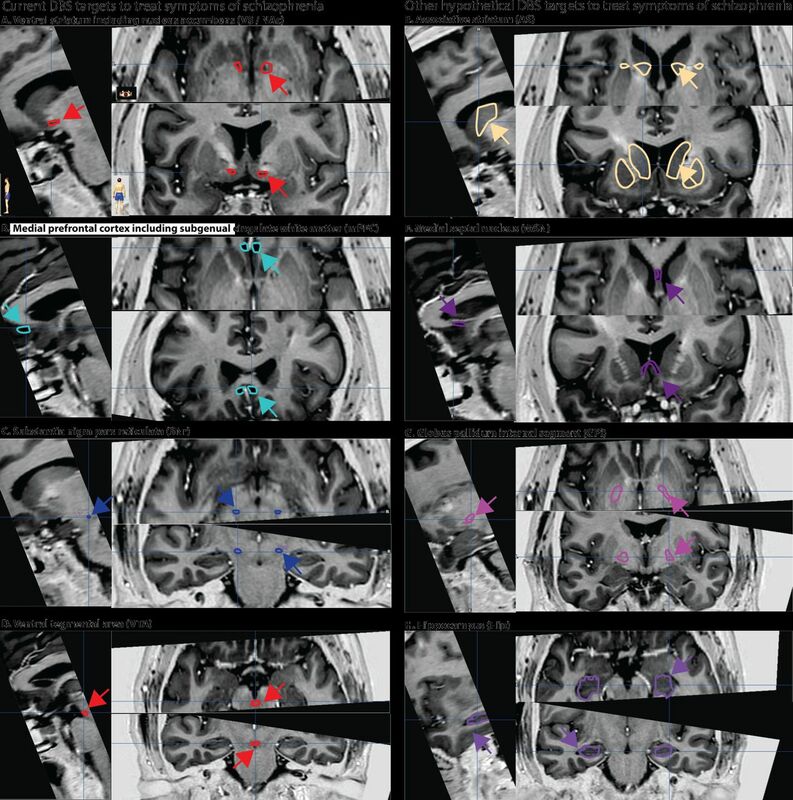 Targets for deep brain stimulation (DBS) to treat symptoms of schizophrenia (SZ) shown with sagittal, axial and coronal MRIs without contrast. Intraoperative biomarkers are needed to facilitate identification of the deep brain structure being targeted. The NAc is a DBS target for both OCD and SZ. Similarly, mPFC is targeted in both major depressive disorder (MDD) and SZ. DBS of either NAc or mPFC targets has been shown in the maternal immune activation (MIA) rat model of SZ to prevent neuroinflammation marked by increased microglial aggregation in the hippocampus.61 Furthermore, DBS of mPFC prevented the development of increased ventricular volumes as well as additional SZ-related developmental abnormalities characteristic of MIA rats, including deficits in: (1) prepulse inhibition (PPI), a measure of sensory motor gating of acoustic startle; (2) disrupted latent inhibition; and (3) discrimination reversal, a measure of executive function.62 Effective DBS of mPFC for patients with MDD is associated with normalising increased rCBF in subgenual cingulate white matter (SGCWM) and changed activity at multiple sites within the limbic-cortical circuitry.63 Possibly relevant to DBS targeting mPFC to treat SZ, effective DBS targeting mPFC in MDD has been associated with theoretical activation of multiple intercepting white matter tracts, including one with connectivity to the striatum and another, the forceps minor, with connectivity to ventromedial frontal cortex. Intraoperative transient stimulation of the forceps minor induces changes in interoceptive and exteroceptive awareness.64–66 Intraoperative detection of these stimulation-induced behavioural changes is indicative of optimal DBS electrode placement within mPFC to treat MDD. For movement disorders, optimal DBS macroelectrode placement can be confirmed intraoperatively when stimulation directly alleviates symptoms of PD or ET without causing intolerable side effects. Before DBS macroelectrode placement, the region likely to provide maximal therapeutic benefit can be identified with microelectrode recordings that identify specific deep brain structures based on both characteristic single-unit activity firing patterns and by noting the physiological effects of stimulation (kinesthetic testing, induced half-smile). Identifying the stimulation-induced half-smile intraoperatively is thought to be necessary, but not sufficient for effective NAc targeting; 60% of patients with OCD treated with DBS respond with a 45.1% reduction of symptoms assessed by Yale Brown Obsessive-Compulsive Scale (YBOCS).64 67 Additional DBS treatment-responsive neurophysiological biomarkers are being investigated in OCD including PPI. In the PPI paradigm, a weaker prepulse proceeding a reflexive startle-inducing pulse normally reduces the startle response measured by eye blink with electroculogram. In both OCD and SZ, the prepulse is less effective at gating the startle response. Pharmacological investigations show that PPI is regulated by dopamine, GLU, serotonin and acetylcholine.68 NAc is part of the PPI circuitry and DBS of NAc, medial dorsal (MD) and mPFC targets relevant to SZ improved PPI in various rat SZ models.11 30 69 70 Therefore, the effects of DBS targeting NAc on PPI were investigated in patients with OCD and DBS improved PPI.68 Overall, YBOCS scores decreased by 22% in the eight patients and higher symptom severity was negatively correlated with lower PPI (−0.60).68 Further investigations are warranted to determine if PPI can be used as a treatment-responsive biomarker. Parallel experiments should be performed during DBS clinical trials for SZ that target NAc to determine whether improving PPI is associated with effective DBS. NCT0237505 targets: (1) mPFC; and (2) NAc─62% reduction in positive and 33% improvement in negative symptoms (https://clinicaltrials.gov/ct2/show/NCT02377505). NCT01725334 targets: (1) NAc; and (2) VTA (withdrawn due to difficulty enrolling patients; https://clinicaltrials.gov/ct2/show/NCT01725334). The response of the first patient with SZ treated with DBS targeting NAc in the clinical trial (NCT0237505) at Barcelona, Spain, was recently reported to show a 62% reduction in positive symptoms and 33% improvement in negative symptoms after 4 weeks of unilateral left side stimulation. Akathisia occurred immediately during bilateral stimulation and after adjusting to unilateral stimulation, the patient experienced a relapse of negative symptoms, with her positive symptoms remaining improved over baseline.28 Treatment-resistant patients are randomised to either mPFC or NAc DBS targeting, with stimulation on until the patient is clinically stabilised. Then, responsive patients are crossed over to either a stimulation ‘on’ or a stimulation ‘off’ group for 3 months. The mPFC target includes the SGCWM, which has been targeted experimentally for treatment-resistant major depression (figure 3, table 2).5 9 10 16 17 25 27–42 Therefore, targeting SGCWM may treat negative symptoms. In addition, this target includes the anterior midline node of the default network that normally deactivates during attention-demanding tasks. In SZ, there is a failure to deactivate during attention-demanding tasks.33 34 At the time of writing, this trial has recruited seven of a planned eight patients (four for each of the two implantation targets), of whom six have progressed to activation of stimulation (one patient suffered postoperative complications which ultimately required removal of the electrodes). The closed DBS clinical trial (NCT01725334) to treat negative symptoms of SZ at University Health Network in Toronto, Canada, proposed two target areas: VS/NAc and VTA. Targeting VS/NAc may treat both positive and negative symptoms of SZ by balancing the dopaminergic tone in the striatum. Recently, a prospective study of anterior capsulotomy without a comparison group reported improvement in 74% of the 100 patients with SZ at a 2-year follow-up.56 57 Consistent with other reports in the Chinese literature, improvement in aggressive behaviour, psychosis and negative symptoms were reported. For OCD, the effectiveness of both capsulotomy and DBS of VS/VC/NAc is similar and DBS of VS/NAc to treat SZ may indirectly validate the capsulotomy findings; the first person with SZ treated in the DBS clinical trial (NCT0237505) targeting VS/NAc did show improvement in both positive and negative symptoms.28 30 31 70 Both VS/NAc and VTA are involved in the reward and motivation pathway that may relate to negative symptoms of SZ. Based on intracranial self-stimulation research used to map circuitry involved in reward in humans and rodents, VTA stimulation is pleasurable.80 VTA dopamine release into the striatum is modulated by NAc in conjunction with the hippocampus (figure 1). In a mechanistic model (model 3) of SZ, high dopamine levels in the striatum accompanied decreased dopamine levels in the prefrontal cortex from mesocortical VTA dopaminergic neurons.27 Stimulating VTA increases dopamine in the VS/NAc and increases activation of cortical structures such as DLPFC in swine, supporting the idea that negative symptoms of SZ may be treated by targeting VTA.77 Likewise, cognitive deficits caused by low dopamine levels in the cortex may be reduced. Patients with severe symptoms despite treatment must have the capacity to consent for a DBS clinical trial in which risks can be estimated, but benefit is not known. Psychiatric populations should have access to the potential benefits of neurosurgical advances. Vigilant evaluation of ethical concerns is paramount when considering the investigation of DBS for patients with SZ (SZ-DBS). The controversial history of psychosurgery may lead many to be wary of DBS. However, when we review the ethical principles in the Belmont Report, with respect to beneficence, respect for persons and justice, the picture is favourable.81 The FDA Humanitarian Device Exemption approval of DBS for OCD can also provide a model for the ethical delivery of DBS in psychiatric disorders. The second principle, respect for persons, is embodied in informed consent. The two ethical considerations are the right for individuals to make autonomous decisions and the protection of those with diminished autonomy. There must be additional ethical justification when researching a vulnerable population such as patients with SZ. Patients with SZ, as a group, perform more poorly than controls on measures of capacity. For example, MacArthur Competence Assessment Tool for Clinical Research (MacCAT-CR SZ) patients score in an impaired range in 22.6% of the cases,87 and on the California Scale of Appreciation (CSA) the three raters found 7.7%, 10.3% and 12.8% incapable.88 It should be noted that the subjects of the CSA study were all outpatients, while the subjects in the MacArthur study were inpatients.87 88 In the Carpenter et al’s study, capacity varied widely, and SDs were large.89 Of patients with SZ who initially performed poorly, a week-long educational intervention resulted in no difference in the mean scores between the SZ group and the normal controls. This patient cohort was skewed towards those with treatment-resistant chronic SZ, likely similar to those who would be DBS candidates. Two additional studies demonstrate the effectiveness of improving comprehension using enhanced consent in patients with SZ.90 Based on these studies, two recommendations include: (1) the capacity to consent to DBS should be assessed by a psychiatrist with extensive experience in capacity evaluation, using a standardised measure of capacity such as the MacCAT-CR, the more clinically feasible MacCAT-Treatment87 or the CSA; and (2) patients who lack capacity upon presentation may have capacity restored with an educational intervention. The third principle, justice, includes equity and fairness in healthcare, and new treatments or experimental procedures should be available to all people equally. Psychiatric populations, including patients with treatment-resistant, severe SZ should have access to the potential benefits of neurosurgical advances. In 2002, the OCD-DBS Collaborative Group developed ethics recommendations for DBS in OCD,91 of relevance to SZ-DBS. These include: institutional review board (IRB) (or equivalent ethics committee) providing oversight; evaluating capacity and obtaining informed consent (processes monitored by a multidisciplinary committee); SZ-DBS candidates meeting defined criteria for severity, chronicity, disability and treatment resistance; excluding those without a capacity to consent; allowing freedom to withdraw from the research; intervention offered at a clinical research centre; assessment and treatment done by a multidisciplinary team which includes a neurosurgeon experienced in DBS and a psychiatrist experienced in the treatment of those with SZ; disclosure of investigator conflict of interest to patients and the IRB; SZ-DBS performed only for the benefit of the patient (to relieve distress and suffering); and SZ-DBS never performed for law enforcement or social/political purposes. Severe symptoms (cognitive,positive or negative)—rating of symptom levels of at least severe of one or more items on a validated scale such as the Brief Psychiatric Rating Scale (BPRS) or the Positive and Negative Syndrome Scale (PANSS) at baseline measurement. Functional impairment as measured by a validated scale, clinical interview and history. Treatment-resistant patients with severe symptoms who are unable to tolerate clozapine at the recommended dose or duration may also be included in the clinical trial. The use of neuromodulation for the treatment of SZ is a controversial subject, and underscores the need for a cautious, thoughtful approach to trial design, so that this vulnerable patient population—that may benefit from SZ-DBS—is protected. As with any clinical trial, the ethical principles of the Belmont Report—including beneficence, respect for persons and justice—provide the critical framework in which such efforts must be tackled. The successful experience with DBS for the treatment of OCD provides a foundation for the ethical delivery of DBS in a population of patients with psychiatric illnesses, and thus has important implications for the treatment of SZ. Finally, appropriate subject selection is always crucial, and subjects enrolled in an SZ-DBS clinical trial should meet criteria for ‘ultra-treatment resistance’, and continue to experience severe symptoms and functional impairment for at least 12 weeks prior to DBS treatment, as measured by standardised psychiatric rating scales. Thorough and responsible consideration of these factors will contribute to ensuring the ethical investigation of SZ-DBS. In summary, evidence is consistent with SZ being a circuit disorder similar to other disorders treated with DBS. 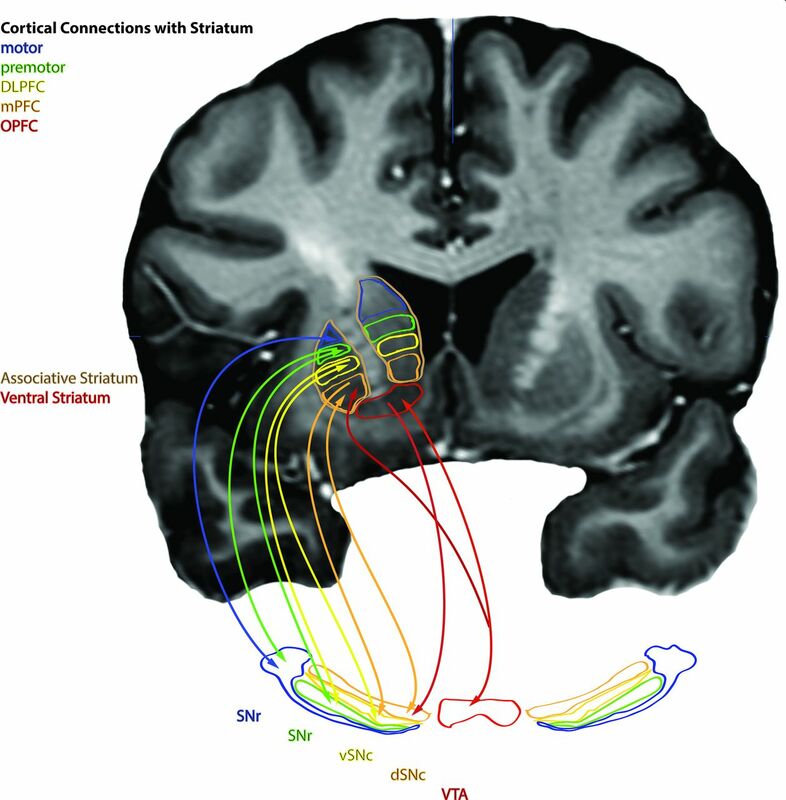 Several lines of evidence together support modulating the striatum with DBS for the treatment of SZ, including: (1) the specificity of antipsychotics for dopamine D2-like receptors that are concentrated in striatum; (2) the occupancy of D2-like receptors in the striatum is associated with effective treatment; (3) increased levels of presynaptic dopamine in the striatum of patients with SZ (may be lower in treatment-resistant patients); (4) genetic findings of association between the DRD2 gene and SZ. Effectively modulating the striatum may be achieved by targeting input structures such as VTA, hippocampus or MSN, targeting the associative and/or VS (including NAc) directly, or targeting BG output structures such as SNr and/or GPi. The targets in ongoing DBS clinical trials include SNr, NAc and mPFC. There are several potential advantages to DBS treatment that may compliment antipsychotic treatment by providing a unique therapeutic mechanism that may benefit otherwise treatment-resistant patients, reduce relapse rates, reduce intensity of residual psychosis, improve cognitive impairment and reduce negative symptoms. The potential benefits of DBS neurosurgical intervention warrant clinical trials in treatment-resistant patients or patients experiencing life-threatening antipsychotic side effects who are capable of providing informed consent. The authors would like to acknowledge the contributions of Peter McKenna, MD, PhD, for information pertaining to clinical trial NCT0237505, and Julia Liedtke for helping with the video.
. Striatonigrostriatal pathways in primates form an ascending spiral from the shell to the dorsolateral striatum. J Neurosci 2000;20:2369–82.
. [Stroke-psychosis. Description of two cases]. Actas Esp Psiquiatr 2009;37:240–2.
. [A case of left dorsomedial thalamic infarction with unilateral schizophrenia-like auditory hallucinations]. Seishin Shinkeigaku Zasshi 2006;108:31–41.
. An emerging concept. The cerebellar contribution to higher function. Arch Neurol 1991;48:1178–87. Department of Health E, and Welfare. The belmont report: ethical principles and guidelines for the protection of human subjects of research. Federal register. Washington, DC: DHEW Publication OS, 1978.
. Protection of persons with mental disorders from research risk: a response to the report of the National Bioethics Advisory Commission. Arch Gen Psychiatry 1999;56:688–93. Contributors JMG: substantial contributions to the conception and design of the work, and the acquisition, analysis and interpretation of data; drafting the work (except the ethics section), revising the entire manuscript critically for important intellectual content; final approval of the version published; agreed to be accountable for all aspects of the work in ensuring that questions related to the accuracy or integrity of any part of the work are appropriately investigated and resolved. RD: final approval of the version published; drafting the ethics section and revising the entire manuscript critically for important intellectual content. NGC: final approval of the version published; drafting the Hopkins clinical trial section and revising the entire manuscript critically for important intellectual content. ERS, JD: final approval of the version published; contributed to the ethics section draft and critical revision; contributed to the video. ICC, EPC: final approval of the version published; drafting the Barcelona Spain clinical trial section and revising it critically for important intellectual content. WSA, JAT: final approval of the version published; revising the entire manuscript for important intellectual content; reviewed accuracy of figure 3 DBS targets. AO, AS: final approval of the version published; revising the entire manuscript for important intellectual content. ZJD, NL: final approval of the version published; revising the University of Toronto clinical trial for important intellectual content. AA: final approval of the version published; critically revised the entire manuscript for important intellectual content; agreed to be accountable for all aspects of the work in ensuring that questions related to the accuracy or integrity of any part of the work are appropriately investigated and resolved. Funding Funding for this work was provided through an Independent Investigator NARSAD Grant through the Brain and Behavior Research Foundation (Grant ID 23295, JMG) and NIH grant 1RC1MH088735.